Visits to the dentist can be scary for any child, but can be especially trying for many children with autism. Some can be unsettled by lights in their faces, or overwhelmed by noises from dental equipment. That's where Zucca, a therapy Labrador, comes in to help make things a little easier. Diego Rosales, who has autism, rests his hands on the paws of therapy dog Zucca during his dental appointment at Los Andes University Medical Center on the outskirts of Santiago, Chile, April 28, 2017. Zucca is one of six dogs employed by Junto a Ti (“Next to You”), a non-profit that specializes in visits to the dentist for children with autism. All six dogs are female, because organizers say they are more docile, and they all receive specialized training. 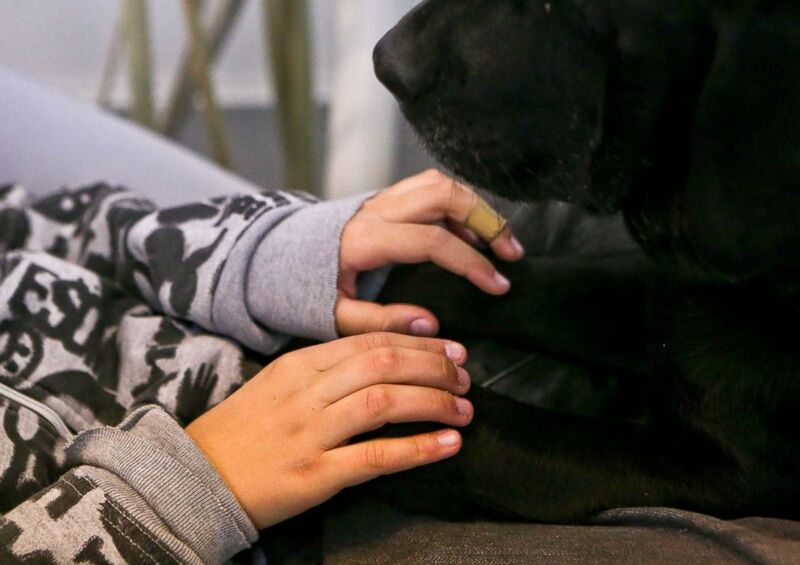 Raul Varela, the man who started the non-profit, noticed that his child, who has autism, had better social interactions after bonding with the family's black Labrador. He quit his job and became certified as a therapy dog trainer for children with autism. Therapy dog Zucca sits on the lap of 9-year-old Diego Rosales, who is autistic, during his dental visit to the Los Andes University Medical Center on the outskirts of Santiago, Chile, April 28, 2017. 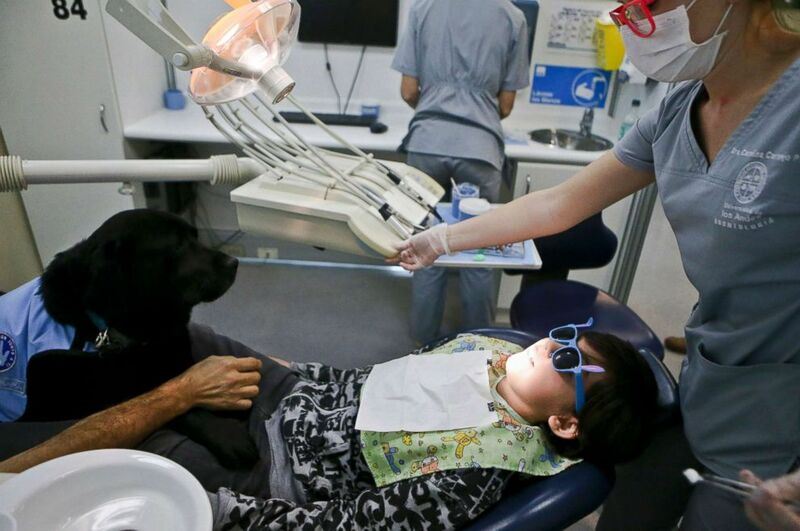 So far, the dogs have "lent a paw" to about 50 children at a dental clinic in Santiago, Chile, according to the Associated Press. One mother said she had "never seen" her son so calm. "He let the dentists work. In fact, he did not even shout." Therapy dog Perry sits between the legs of a young, autistic patient during his dental appointment at the Los Andes University Medical Center on the outskirts of Santiago, Chile, April 28, 2017. 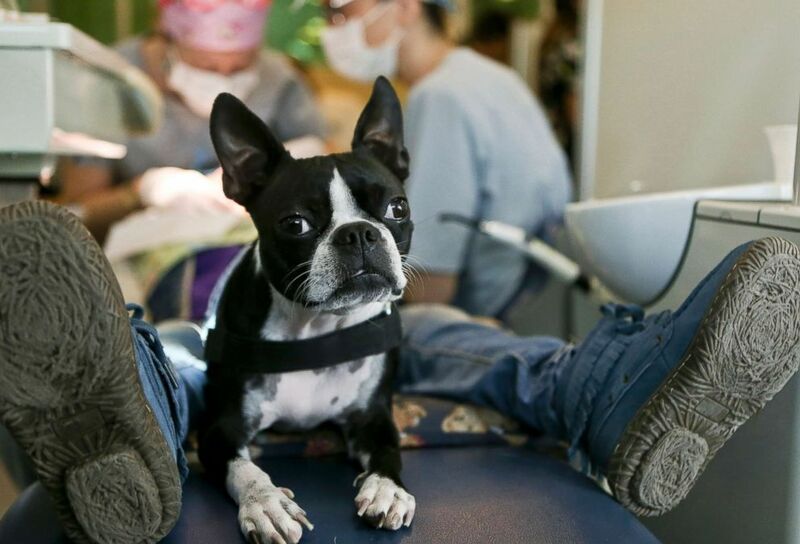 The clinic pays about $67 for a session with a dog, though charges vary depending on the family's economic level.